News outlets must understand consumer issues in order to address the ongoing issues and impact of fake news and misinformation. In fact, trust in those who report the news matters in how information is interpreted according to a new study from the Pew Research Center. The research, Distinguishing between Factual and Opinion Statements in the News, examines American readers’ ability to correctly distinguish news statement as fact or opinion. Five news statements based on fact, five news statements based on opinion, and two ambiguous statements were included in the survey. The findings show that approximately 72% of adults can correctly identify three or more factual statements and 78% can correctly identify three or opinion statements. Still, few adults can classify all five statements correctly. 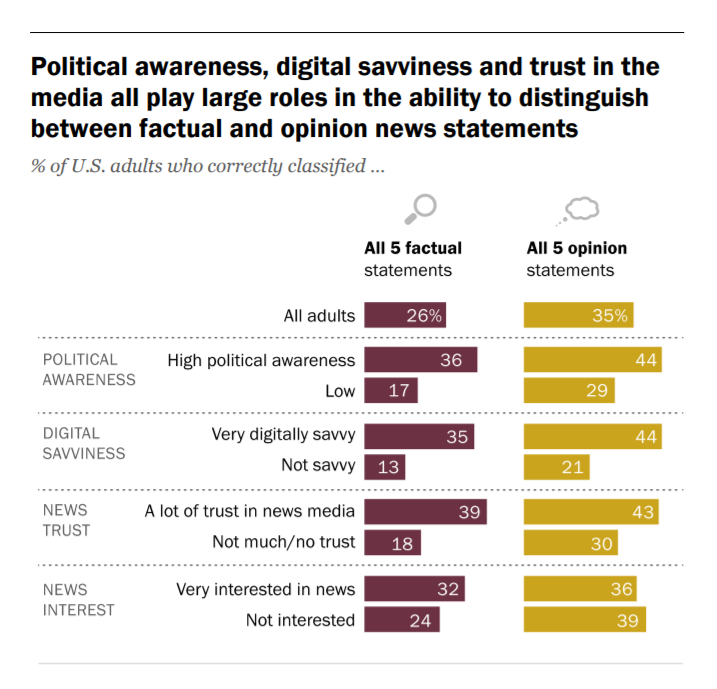 Importantly, nearly four-in-ten adults (39%), who trust information from national news organizations, correctly identify factual statements, compared with 18% of those who do not trust national news publishers. Adults with higher political and high digital savviness (those who use digital devices and the internet regularly) are much more likely to know the difference between news statements of fact and opinion. Further, those with higher education are also more likely to classify factual and opinion statements correctly. The Pew research also investigates the impact of political affiliation on the ability to discern between factual news states and those of opinion. Republicans and Democrats alike are more likely to classify both factual and opinion statements as factual when they appeal to their side. For example, 89% of Democrats accurately identified the factual statement “President Barack Obama was born in the United States” compared to 63% of Republicans. In contrast, 37% Democrats incorrectly classified the opinion statement “Increasing the federal minimum wage to $15 an hour is essential for the health of the U.S. economy” as factual, compared to 17% of Republicans. In a second set of statements, Pew examines the impact of adding news outlet attribution (The New York Times, Fox News, and USA Today) to factual news and opinion statements. Overall, news outlet attribution has limited effect, with one exception: FOX News. 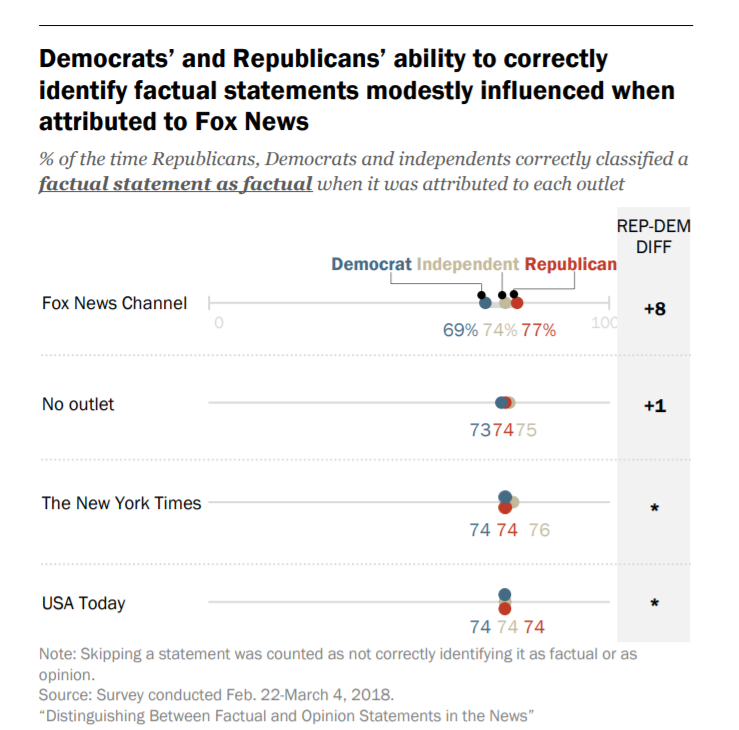 Republicans were modestly more likely than Democrats to accurately classify factual statements when they were attributed to Fox News Channel. News outlets had no impact on Democrats or Republicans when it came to opinion statements. It’s important for Americans to learn how to navigate media platforms and sort through news with an analytical lens to correctly identify between news facts from opinion. It’s also an opportunity for premium news outlets to offer prompts and clear points of distinction between news facts and opinion.